CROWDS AS DIVERSE and far-flung as the apples they came to admire swarmed on Franklin County in western Massachusetts last weekend like honeybees to nectar. The event was the weekend-long extravaganza known as CiderDays, now in its 19th year. As always, there were a host of orchard tours, workshops on cider-making, apple growing, and baking with apples, at places like Clarkdale Fruit Farm in Deerfield, and Pine Hill Orchards and West County Cider, both in Colrain. There were tastings of cider, fresh and hard, produced by mainstream companies, counterculture entrepreneurs, and backyard enthusiasts. There was plenty of food, including an apple pancake breakfast in Greenfield and a harvest supper in Shelburne. Cider-makers large and small debated the merits of Cortlands, Winter Bananas, and Tremlett’s Bitters as they sampled unfiltered, fresh and fermented apple juice at the orchards, in the Shelburne Buckland Community Center, or on the sidewalks where they met. They came from around the country, these localvores and gourmets, the apple militia; an agricultural army celebrating the harvest, but ready to do battle to preserve, protect, and promote the apple, bottling, sipping, and trading its juice like liquid gold. Franklin County is wide and CiderDays inclusive. Getting to all of the events is challenging and provides a logistical challenge, as it takes more than one hour to drive the 40-plus miles from the easternmost venue in New Salem, home of New Salem Preserves, to the town of Hawley along the county’s western edge, where Headwater Cider is located. 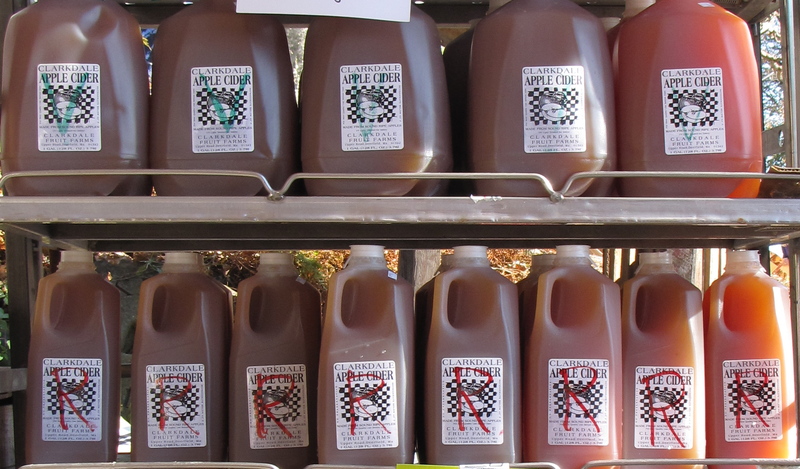 Two participating orchards in Ashfield, Bear Swamp and Brook Farm, are nearby Headwater Cider. Sunday I made these three orchards my destination. 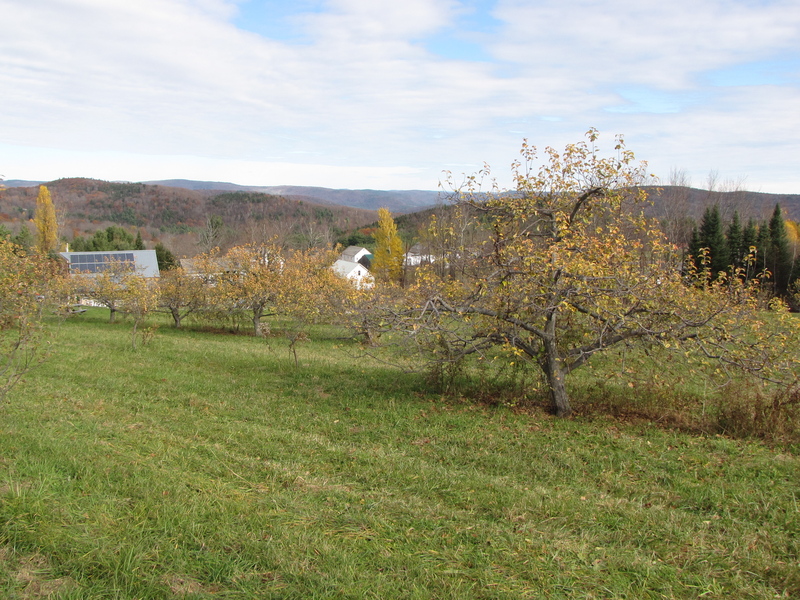 The foothills of the Berkshires are beautiful but remote, and these out-of-the-way farms are much smaller than orchards like Clarkdale and Pine Hill, with niche products and modest aims. 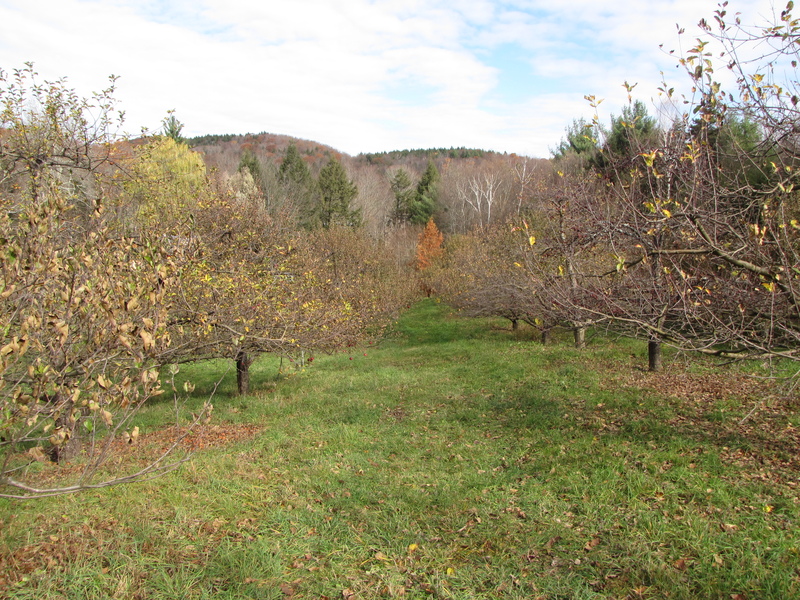 Bear Swamp Orchard, for example, grows apples organically on just a few acres. They make fresh and hard cider in a solar-powered mill, and an array of other apple products (including an outstanding cider donut). They also make and sell maple syrup and firewood, grow grain and vegetables, and pasture sheep to supplement their apple income. They had sold out of fresh apples long before CiderDays. I drank a cup of fresh cider with my donut, and it was very good, but it was too early in the day for me to sample their hard cider. Brook Farm Orchard is even smaller than Bear Swamp, with just 100 trees on a gentle hillside, including 30 varieties of apples, plus peaches, plums, Asian pears, and filberts. They sell their fruit at a local farmer’s market and Community Supported Agriculture (CSA) shares from the farm. Among the varieties they displayed Sunday were heirlooms like Baldwin and Winesap, and newer varieties like Keepsake and Fireside, both developed at the University of Minnesota, making them good choices for the cold winters and shorter growing season of this hill town. Fireside (also known as Connell Red) was introduced in 1943. A pretty, round apple mostly red, it had a good, sweet flavor but a tough skin, and not much juice. Keepsake (1978), another mostly red apple, is crispy, juicy, and aromatic, with a nice tangy flavor. Its biggest claim to fame, though, is that it is a parent of Honeycrisp, the biggest apple to hit the market in the past 25 years. Like Fireside, Keepsake keeps well in storage, and its flavor is said to improve over time. Headwater Cider Company is the largest of the three orchards, with about 20 acres of apples, all cultivated for their properties in hard cider. 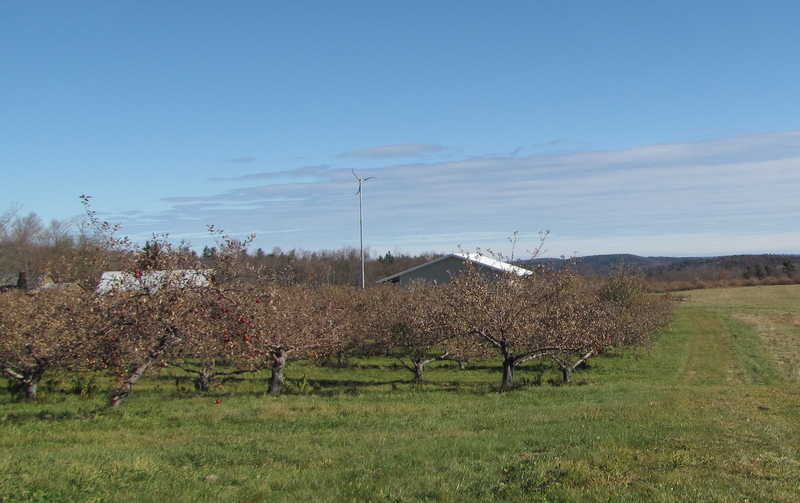 Owner Peter Mitchell bought the orchard in 2005 from Apex Orchards, which decided it could no longer run the satellite farm profitably, nearly 20 miles from its main orchard in Shelburne Falls. Mitchell inherited Cortland, Empire, and McIntosh trees, to which he has been slowly adding (he is now up to 34 varieties). Like many growers, Mitchell tried another career before he settled on apples. Mitchell earned his bachelor’s degree from nearby University of Massachusetts, where he rowed crew for all four years (he remains an avid boater). He went on to earn a master’s degree in English before switching to producing hard cider made from his own apples. All three orchards welcomed good crowds during CiderDays, and visitors to Headwater Cider were treated to samples of their “New England Dry” and Ashton Bend” hard ciders, and refreshments like the apple cake below. The ciders were nice blends — not too sweet yet retaining plenty of complex apple flavor. The cake was so good we asked for the recipe. Several weeks ago we published the award-winning recipe for Mrs. Cheney’s Nobby Apple Cake. Joan Dybvig’s version is similar, but there are differences besides the silent “k” in “knobby.” For one, Joan spreads a solid layer of walnut pieces on top of the cake rather than mixing it in the batter. Joan’s recipe does not specify an amount of walnuts, but Gerda’s version Sunday had more than the 1/4 cup used by Mrs. Cheney, and the nuts were excellent, contrasting nicely in flavor and texture with the cooked apples. Cream the butter and sugars. Add egg and stir. Add dry ingredients and vanilla and mix to make a stiff batter. Add apples, and pour in a well-greased 8×8 pan.